Wailuku, HI, July 18, 2018 --(PR.com)-- Rev. 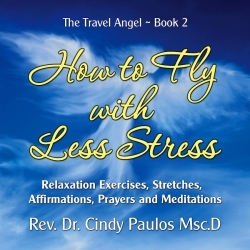 Cindy Paulos has released a new audio book of "How to Fly with Less Stress." "How to Fly with Less Stress" is volume 2 of the Travel Angel. It is available on Amazon, Audible, and iTunes. Cindy is a long time DJ, author, travel agent, speaker, metaphysical Minister, artist, composer, and lyricist. "How to Fly with Less Stress" audio book offers you inspired messages that are designed to help reduce the stress, anxiety, and fear that can occur when traveling. "How to Fly with Less Stress" has over 250 travel tips that range from practical information you need to know for your health while flying and also includes positive affirmations, prayers, relaxation techniques that are useful. There are dozens of stretches that are designed to do while seated on a plane. Cindy has a long background in Voice Work, and has done 5 Spoken word CD’s and thousands of radio shows and interviews in her 40 plus years of radio. Cindy now hosts the longest running talk show on Maui, which has aired for over 29 years. She hosts a weekly travel show, which Is Hawaii’s only travel radio show. She has been doing inspirational writing most of her life and she holds a Doctorate in Metaphysics. She is also travel agent and has travel blog and has traveled to over 37 countries throughout the world. www.amazon.com/How-Fly-Less-Stress-Affirmations/dp/B07DRNBBMP/ref=sr_1_1_twi_audd_3 Cindy is available for interviews.